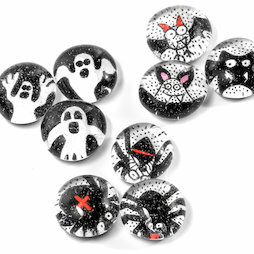 Our Halloween magnets are frighteningly sweet! These decorative glass magnets with hand-painted designs are carefully created in Switzerland. They are one-of-a-kind and, thanks to their strong neodymium magnets on the backside, adhere nicely to magnetic boards, fridges, or whiteboards.